Chris speed has created a new and very unique prototype coffee machine called the BitBarista which takes the form of an autonomous corporation which can run itself without any human interference. Watch the video below to learn more about the unique project which provides lessons about “ethical responsibility and the value of quality”. 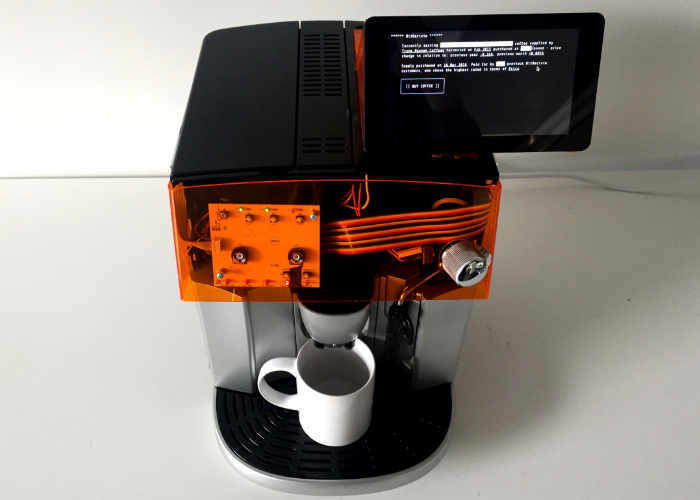 The research team at University of Edinburgh’s Center for Design Informatics have built the autonomous corporation proof-of-concept using a Raspberry Pi mini PC and a modified Delonghi coffee maker to great effect. The interesting prototypeworks in conjunction with coffee customers to source coffee beans and complete maintenance tasks in exchange for BitCoin payments. BitBarista customers pay for their coffee in BitCoin, but when BitBarista needs maintenance such as cleaning, water replenishment, or restocking, it can pay the same customers for completing those tasks with BitCoin continuing the cycle of automation. BitBarista is an example of an Internet of Things device, one of a growing number of devices connected to the internet that can collect, exchange and use data. BitBarista uses Bitcoin currency enabling customers to engage with this new form of transaction that can move beyond currency into new types of value exchange. BitBarista is a Delonghi home coffee machine that has been enhanced by the addition of a Raspberry Pi computer which interfaces with the coffee machine enabling the computer to control its functions. BitBarista has its own Bitcoin account, so it can accept and make Bitcoin payments. This means that customers can pay for coffee in Bitcoin, and BitBarista can also make Bitcoin payments to customers in return for maintenance tasks such as refilling the water or cleaning away coffee grinds. The idea is that BitBarista becomes semi-autonomous, trading with customers to take care of its own maintenance requirements.